San Francisco, March 18: In a surprise move ahead of its expected launch of a video streaming service next week, Apple on Monday introduced an all-new 10.5-inch iPad Air and 7.9-inch iPad mini. The new iPad mini and iPad Air come in silver, space gray and gold finishes in 64GB and 256GB configurations and offer keyboard support for the first time. The new iPad mini starts at $399 for the Wi-Fi model and $529 for the Wi-Fi and Cellular model and the 10.5-inch iPad Air starts at $499 for the Wi-Fi model and $629 for the Wi-Fi + Cellular model, the company said in a statement. The devices will arrive later in India. With the A12 Bionic chip with Apple's Neural Engine, the new iPad Air delivers a 70 per cent boost in performance and twice the graphics capability, and the advanced Retina display with "True Tone" technology is nearly 20 per cent larger with over half a million more pixels. The 7.9-inch iPad mini also has the A12 Bionic chip, delivering three times the performance and nine times faster graphics. The advanced Retina display with True Tone technology and wide colour support is 25 percent brighter and has the highest pixel density of any iPad. Apple HomePod smart speaker Will Soon Arrive in China & Hong Kong From January 18, 2019 - Report. Both the devices have Apple Pencil support. "The iPad family takes two big leaps forward with an all-new 10.5-inch iPad Air that brings high-end size, features and performance at a breakthrough price, and a major upgrade to the 7.9-inch iPad mini, which also brings Apple Pencil, Retina display and the A12 Bionic chip to the many customers that love its compact size," informed Phil Schiller, Apple's Senior Vice President of Worldwide Marketing. Apple Eavesdropping Bug: Here's How You Can Disable FaceTime on Your Apple iPhone or iPad. 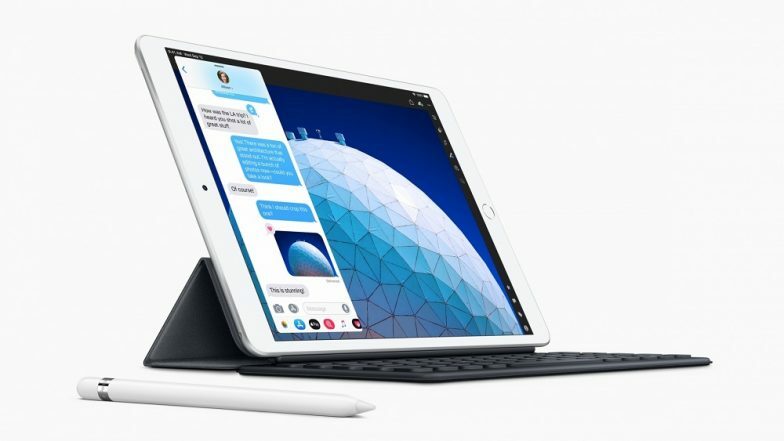 More than 1.3 million apps are designed specifically for iPad - from engaging AR experiences to drawing with Apple Pencil and connecting with friends and family, said the company. With advanced front and back-facing cameras, iPad mini and iPad Air can capture high-resolution photos and video and make editing 4K films easy and smooth. Apple is hosting an event at the Steve Jobs Theater in Cupertino, California on March 25 where it is expected to announce a Netflix-like video streaming service along with a new Apple news offering.